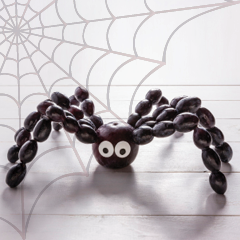 Treat your Halloween guests to a tasty fruit creation: Spiderlicious! Get ready for your Halloween party by making Spiderlicious, a tasty fruit creation. Easy and fun to make—and perfect for decorating your festive table— Spiderlicious is a healthy alternative to sugary treats during Halloween.